People Habitat explores topics as diverse as “green” housing developments that are no such thing, the tricky matter of gentrifying inner cities, why people don’t walk much anymore, and the relationship between cities and religion. Written with intellect, insight, and from-the-heart candor, each real-world story in People Habitat will make you see our communities in a new light. 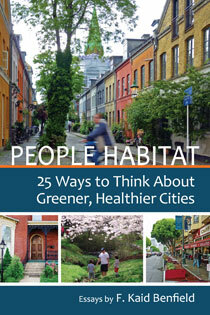 "People Habitat promises to give us 25 ways to look at greener, healthier cities, but as anyone who has read one of Kaid Benfield's books, articles, or blog posts knows, he delivers at least that many insights on every page. He doesn't just love cities—he gets them, in all their social, demographic, economic, and almost always paradoxical and volatile complexity." Richard Florida, co-founder and Editor-at-Large, "The Atlantic Cities"
"Kaid Benfield's writings about the shape and strength of our communities constantly challenge readers to think about issues and problems in new ways. He correctly reminds us that 'green' is not always green, 'sustainable' is often not, and 'smart growth' is more than a tag to be hung on a new project like a sales ticket." "Kaid Benfield, like Jane Jacobs, is a talented writer who isn't burdened by preconceptions or jargon, who can explain the ideas of others or express his own in a style that is accessible and comprehensible. These 25 essays are not just about cities; they are about making sense of the way we live." "Kaid Benfield, an environmentalist who loves cities, exposes the phoniness of claiming 'green' status for buildings that can only be reached by car. If you love cities, you'll love Kaid's book." Hon. John O. Norquist, former Mayor of Milwaukee; author of "The Wealth of Cities"
"I strongly encourage anyone with even a passing interest in the quality of the place where they live to read Kaid Benfield's writing. His framing of the ecology of 'people habitat' is immensely useful in celebrating how an enormous number of small actions to create healthier local places can contribute to a healthier planet." "Reading this book was like sitting around a fire talking about city life with an old friend. If you have not read Kaid before, he will quickly feel like an old friend, talking directly from and to the heart, getting to the essence of what makes places that we love and what we can do to make more places like them." "...Benfield shows he is no dogmatic New Urbanist; he sees the value of design and nature." "It's truly a delightful and leisurely read, and... points to how we need to get over our addiction to fossil fuels, invest our time and thought in how we build our primary communities, and the importance we place on preserving not just the natural world, but our cities, for future generations." "On the whole, people who care about the shaping of the built environment—from neighborhoods to regions—will find Benfield's book stimulating and immensely readable. And more than that: wise." "...this is the discourse we desperately need in planning and designing our cities..."
Chapter 25. Sprawl Is Dying. Will Smart Growth Be Next?